Giving is one way that we may exercise good steward ship of God’s resources. Through the Holy Spirit that dwells within us, God compels us to share the abundance that He, in His great love for us, has provided. This giving may take many forms: we may give of our monetary resources, of our material wealth, or of our time and energies. All of these are gifts of God to us, which we can use to benefit others in accordance with His will and Word. Stewardship is the recognition of our responsibility properly to use all that God has so richly given to us for His purposes, for His honor, and for His glory. Good stewardship involves managing well the resources with which we have been blessed. This may take the form of regular tithing, pledging a certain amount as an offering, giving real property or financial instruments to the church, willing property to the church, and giving of our time and energy in service. Tithing is how we, as believers in Jesus Christ, show our commitment to our church; our heart for those less fortunate in our community and in the world; our obedience to the Word of God; and our trust in the Lord to provide for us as we give. It may take the form of giving cash, resources needed by others, or our time and energy in serving others selflessly. Tithing not only provides for the needs of others, it comes back to us beneficially in the form of building in us, an attitude of humility, service, and obedience to our Lord’s teachings. Kiowa Creek Community Church seeks love gifts for the financial support of its services, activities, and ministries. Donations are essential to performing the church’s functions in the body of Christ. Monetary donations in any amount are accepted at one of the regular worship services on Sundays or through the church office. 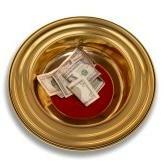 You may also try eGiving, the 21st Century way to tithe. To learn more, please call the church office. All who benefit from the activities of the church are urged to pray in faith for God’s guidance and to remember to give, so that our church may continue to provide for the needs of the congregation and community. Many thanks to those of you who give so freely of your personal time and regularly provide financial support to the church. Your goodness and generosity are greatly appreciated! Pledging is making a commitment to give to the church. It obliges you to follow up on good intentions with positive action. Please remember, pledging is not just a once-a-year event; you may pledge to the church any amount of cash or property at any time. We encourage you to make a commitment to the growth of our church soon, through your generous pledge. To pledge your love gift, please call the church office. Legacy gifts are gifts of real property to the church upon the death of the owner. For more information on this unique way of giving, please call the church office. None present at this time.